Black Walnut Hulls come from the immature fruit of the Black Walnut Tree, Juglans nigra, a short-trunked forest tree with a spreading crown. The Black Walnut Tree is indigenous to the Middle East, but it is currently grown in the U.S., Canada and Europe as well. 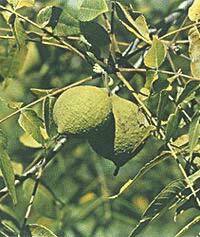 In the U.S., the Black Walnut Tree is found from Georgia as far west as Kansas and Minnesota. Water, grain alcohol, green black walnut hulls. Dropper is included. Average tincture strength: 23% (46 proof). Hull to grain alcohol ratio: (hull : grain alcohol) 1:0.68. Black Walnut Hull tincture is traditionally used to help nutritionally support the normal cleansing of the body of waste materials and create an environment unfriendly to parasites. Always start with 1 drop, increase dose by 1 drop per day for 5 days. Adults and Children 12 or more years of age: up to 2 teaspoons one time a day as a supplement , or as directed by a health care professional. Please do personal research and consult with your health care professional before giving any herbs to children. The educational directions enclosed suggest a much lower quantity for children than for adults. It is important to read accompanying literature prior to using this product. Do not take during pregnancy or lactation.